BULAWAYO, Zimbabwe, Jun 15 2017 (IPS) - Urban farmer Margaret Gauti Mpofu would do anything to protect the productivity of her land. Healthy soil means she is assured of harvest and enough food and income to look after her family. 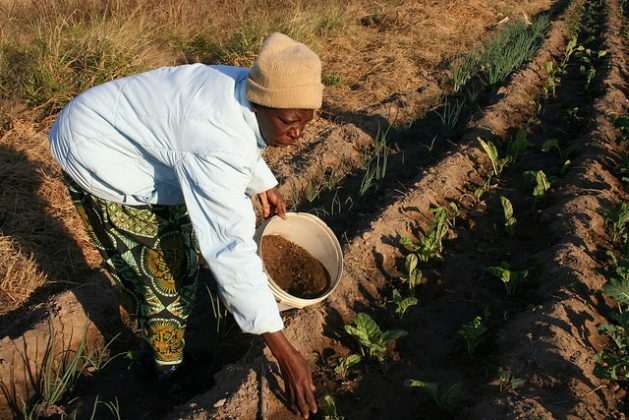 Each morning, Mpofu, 54, treks to her 5,000-square-metre plot in Hyde Park, about 20 km west of the city of Bulawayo. With a 20-litre plastic bucket filled with cow manure in hand, Mpofu expertly scoops the compost and sprinkles a handful besides thriving leaf vegetables and onions planted in rows across the length of the field, which is irrigated with treated waste water. Mpofu’s act of feeding the land is minuscule in fighting the big problem of land degradation. But replicated by many farmers on a large scale, it can restore the productivity of arable land. Mpofu’s act of feeding the land is minuscule in fighting the big problem of land degradation. But replicated by many farmers on a large scale, it can restore the productivity of arable land, today threatened by desertification and degradation. While desertification does include the encroachment of sand dunes on productive land, unsustainable farming practices such as slash and burn methods in land clearing, incorrect irrigation, water erosion, overgrazing – which removes grass cover and erodes topsoil – as well as climate change are also major contributors to desertification. Desertification is on the march. Many people are going hungry because degraded lands affects agriculture, a key source of livelihood and food in much of Africa. More than 2.6 billion people live off agriculture in the world. More than half of agricultural land is affected by soil degradation, according to the United Nations Convention to Combat Desertification (UNCCD). The UN Food and Agriculture Organization (FAO) estimates that by 2030 Africa will lose two-thirds of its arable land if the march of desertification — the spread of arid, desert-like areas of land — is not stopped. This year the WDCD is focusing on the link between land degradation and migration and how local communities can build resilience to several development challenges through sustainable management practices. The number of international migrants worldwide has grown from 222 million in 2010 to 244 million in 2015, according to the United Nations. The UNCCD says behind these numbers are links between migration and development challenges, in particular, the consequences of environmental degradation, political instability, food insecurity and poverty. “Migration is high on the political agenda all over the world as some rural communities feel left behind and others flee their lands,” Monique Barbut, UNCCD Executive Secretary, said in a public statement ahead of the global observation of the WDCD. Barbut said more than 100 of the 169 countries affected by desertification or drought are setting national targets to curb a runaway land degradation by the year 2030. “Investing in the land will create local jobs and give households and communities a fighting chance to live, which will, in turn, strengthen national security and our future prospects for sustainability,” said Barbut. The 17th of June was designated by the United Nations as the World Day to Combat Desertification to raise public awareness about the challenges of desertification, land degradation and drought and to promote the implementation of the UNCCD in countries experiencing serious drought and desertification, particularly in Africa. The 1992 Rio Earth Summit identified desertification together with climate change and biodiversity loss as the greatest challenges to sustainable development. The UNCCD was established to galvanize global efforts to maintain and restore land and soil productivity while mitigating the effects of droughts in the semi-arid and dry sub humid areas where some 2 billion people depend on the ecosystem there. In May 2017, a high-level event on Land Degradation, Desertification and Drought held at the UN headquarters and organized by the Permanent Mission of Qatar, Iceland and Namibia together with the office of the President of the General Assembly underlined Land Degradation Neutrality (LDN) as a catalyst in meeting the Sustainable Development Goals. Sustainable Development Goal 15 emphasizes the protection, restoration and promotion of sustainable use of terrestrial ecosystems, sustainable forest management, combating desertification, halt and reverse land degradation and halt biodiversity loss. “More than half of the world’s agricultural land is affected by soil degradation, and the deterioration of dry lands has led to the desertification of 3.6 billion hectares of land,” Ambassador Peter Thomson, President of the General Assembly, told the high level meeting, citing the drought and famine which affected millions of people across Africa. Last year, many countries in Southern Africa declared a drought disaster. The Southern Africa Development Community launched a 2.4-billion-dollar food and humanitarian aid appeal for 40 million people affected by a drought that was the worst in more than 30 years. With food demand expected to grow by 50 percent to 2030, there will be greater demand for land, leading to even more deforestation and environmental degradation if global action is not taken to restore the productivity of degraded lands. The UNCCD is promoting a land degradation neutral world by 2030. It has set the Target 15.3 to combat desertification, restore degraded land and soil, including land affected by desertification, drought and floods, and strive to achieve a land degradation-neutral world. Achieving SDG target 15.3 would empower women and girls who mostly bear the brunt of desertification, land degradation and drought, and also contribute to ending poverty and ensuring food security, said the Group of Friends on Land Degradation, Desertification and Drought co-chaired by Ambassador Einar Gunnarsson of Iceland and Ambassador Neville Gertze of Namibia. The world cannot grow new land but there is good news. Degraded land can be restored. Burkina Faso, which is hosting the official global events to mark the 2017 WDCD, has shown the way. The West African nation, one of the early signatories to the UNCCD, has since the early 1980s been rehabilitating degraded land by building on our traditional techniques such as the Zaï and adopting new techniques that work such as farmer managed natural regeneration. “We are hosting the global observance on 17 June because we want to show the world, what we have achieved and is possible in order to inspire everyone into action,” Batio Bassiere, Burkina Faso’s Minister of Environment, Green Economy and Climate Change, said in a statement. Innovative farmer Yacouba Sawadogo from northwestern Burkina Faso is credited with using an old practice known as ‘zai’ in which holes are dug into hard ground and filled with compost where seeds are planted. During the rainy season the holes catch water and retain moisture and nutrients for the seeds during the dry season. Within 30 years, Sawadogo has turned a degraded area into a 15-hectare forest with several tree species in a country where overgrazing and over-farming had led to soil erosion and drying.